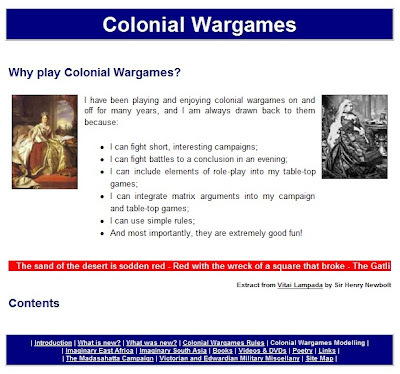 After nearly five months I finally got round to updating my Colonial Wargaming website. Mind you, all I managed to do was to rename the old WHAT IS NEW? page to become WHAT WAS NEW IN 2009? and to create a new WHAT IS NEW? page. The problem with the website has been twofold. Firstly, my blogging has rather taken precedence over updating my websites. Secondly, Microsoft have replaced FrontPage (the program I used to use to create my web pages) with Expression Web, and I have yet to get to grips with the latter. I am sure that once I have, I will be able to keep my websites up-to-date. Yeah, Blogger makes things so easy that it is a bit of a pain to edit websites, isn't it? I have never used any sort of editor for my websites because my wife taught me to use HTML many years ago, so I've always done my own coding . . . but that still isn't as easy as Blogger. So I salute you for refreshing your website (which I've found quite useful over the years). Thank you for maintaining it. I like doing my own coding – in fact most of my blog entries are written on WordPad in the restricted html that BlogSpot allows and then copied over – but for some of the things that I wanted to do on my websites a web authoring program was faster and more convenient. I like html, and have used it to teach simple programming because you can see the results of a command as soon as it is written, unlike so many other computer languages. I hope that now I am getting to grips with Expression Web I will be able to update my blog slightly more frequently than in the past.